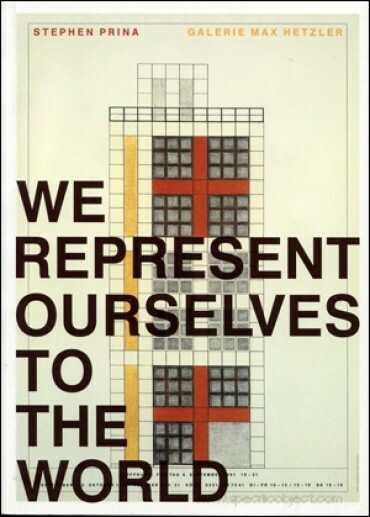 "This distinctive book utilizes a single artwork by the artists Stephen Prina as a frame within which to explore themes vital to its making: artistic production, site specificity, curatorial practice, photography, architecture, and institutional critique. 'Galerie Max Hetzler,' a large-scale installation work comprised of 163 photographs, 9 architectural models, and a single enormous wall graphic, is re-sited for the page. Borrowing its title from the phrase coined by Prina for his installation, 'We Represent Oursleves to the World' operates as a site of dialogue in which to explore ideas that inform one particular work or art, but also have more general implications." -- from book's back cover. Book consists of 163 full-page reproductions of a chronological history of the Max Hetzler Gallery as framed by Prina. Critical essay by Jenelle Porter, and additional texts by James Meyer, Wilhelm Schürmann. Design by Purtill Family Business.